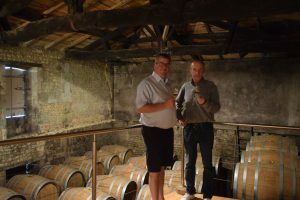 Now that Jenna and Cameron are handling all the sales and Julie and Jess have got all the orders, despatches etc under control it gives me much more time to do the real hard work, like my recent holiday work trip to Cognac to visit our main Cognac supplier Charpentier. 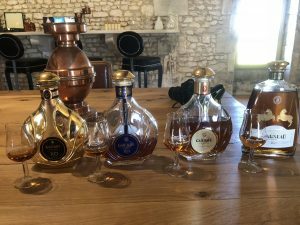 This trip really opened my eyes to Cognac and to the similarities with whisky (and some huge differences) and in particular a lot of similarities between Charpentier and Cadenhead’s in terms of ethos and history. If you try googling Charpentier distillery you probably won’t find much other than links to our recent bottlings of 30yo, 45yo and 50yo – often on auction sites I may add…. 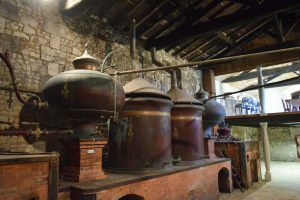 The reason for this is that the distillery themselves have never bottled Cognac under their own name and currently bottle under the Guerbe brande. Guerbe is a brand of Cognac that they took over a few years ago and they also bottle an excellent brandy under the Dagneau branding. Interestingly Cadenheads had previously bottled Cognac from Guerbe. 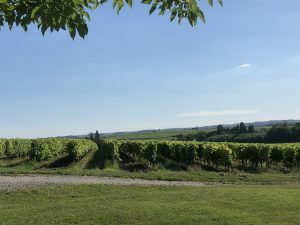 The distillery, with 52 hectares of vines planted, is owned and ran by my host for the trip Francois Charpentier, someone with a real passion for what he does, along with great honesty, which I connected with immediately. Francois became the fifth generation of the Charpentier family to have owned the distillery when he took over the business from his mother in 2012 – the same year that I was lucky enough to join the Cadenhead team. 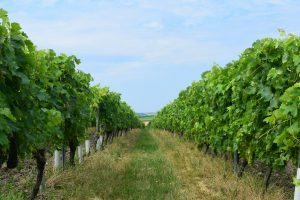 The family acquired the vineyard in 1895 at a very acceptable price due to the Phylloxera crisis that had devastated French Vineyards and this led the family to replant the whole vineyard. They have been making Cognac from these grapes since 1904. Just like in whisky, the majority of Cognacs sold are blended as the Cognac producers rely on supplying the big blending houses as their main source of income. However, Cognac producers seem to be much more open about the fact that this happens. 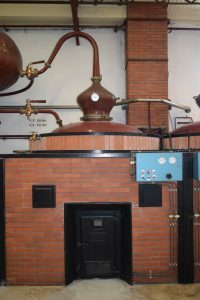 Francois, for example, is quite proud to be able to say that their distillery supplies Hennessy and keeps a small percentage of the Cognac each year for their own use. Francois also organised a trip around Hennessy for us and it was certainly an excellent experience. 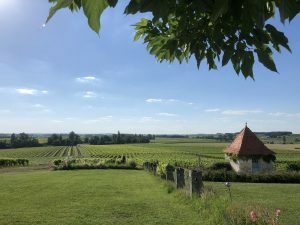 The whole tour was exceptionally slick and very well done – including a small boat ride across the Charente river to get from the visitors centre to the warehouse. 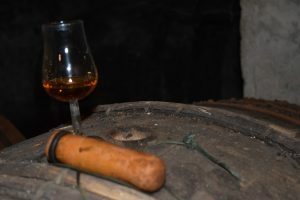 It was refreshing to see the honesty of Hennessy openly admitting that they produce less than 1% of the Cognac that they use for their releases and that they work with over 1500 Cognac suppliers such as Francois’ Charpentier distillery. 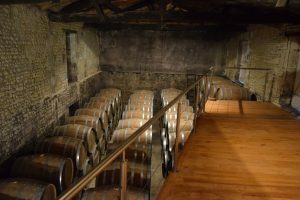 I would certainly recommend the tour around Hennessy for anyone visiting the town of Cognac. 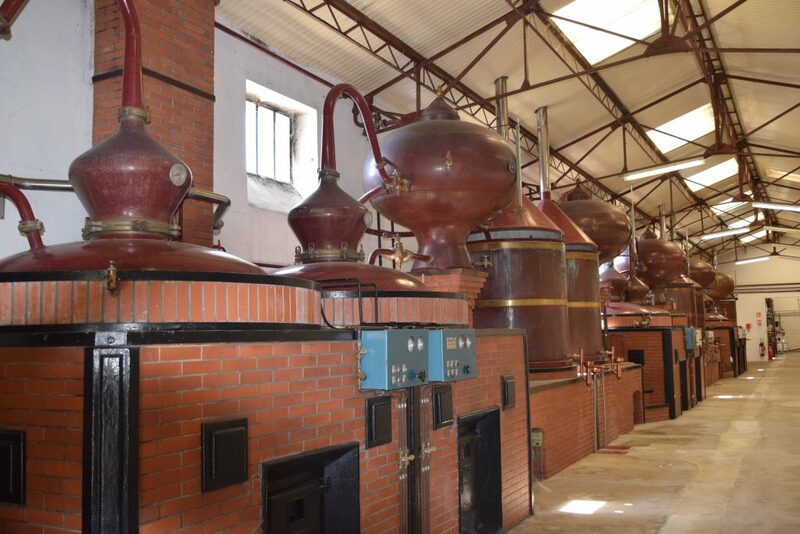 The distillery itself is quite small but the 6 stills have an annual capacity of 450,000 litres of alcohol per year. They employ 8 people and carry out all of the production on site, including bottling – they are actually building a new bottling hall on site that I hope to be able to see on my next visit. For Scotch Whisky we always complain that we are perhaps over regulated, however I think that we have it fairly easy in terms of freedom compared to Cognac which is highly regulated. 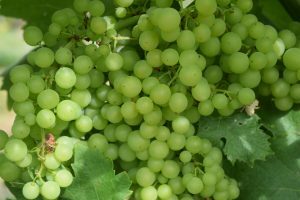 One of the most amazing rules I discovered is that there is a limit to how much yield that you can get per hectare of grapes planted – any over production can be distilled and made into Eau De Vie but must be stored in an inert container and only used in years that the yield is under the designated yield allowance. I would love to see Diageo’s reaction (or Springbank’s for that matter) if Scotch Whisky rules dictated that you were getting too much yield from your barely and therefore you cannot mature any of the excess spirit that you have made until your yield drops to an acceptable level! The original Charpentier distillery closed in 1972 and is preserved as a museum, with the most amazing tasting room overhead where you overlook the old still house on one side and a small warehouse of maturing casks on the other. I am going to suggest that we get a similar set up in a warehouse in Campbeltown but not sure the bosses will go for it. 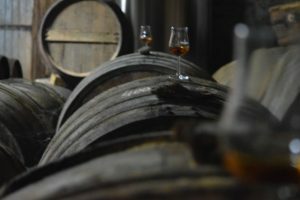 Obviously I was in Cognac to purchase some Cognac for Cadenhead’s and this trip worked out how people probably expect the whisky industry to work for Independent bottlers – we visit distilleries, taste casks and pick what we want. 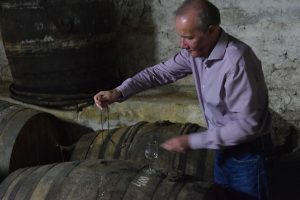 Newsflash – in Scotland it rarely works like this – I have bought casks by text message before and more often than not I am buying from brokers rather than from the distillery directly – this trip was far different. At Charpentier I had complete freedom. Following a tour of the distillery, Francois and I went to the warehouse which is attached to his mother’s house – imagine having a door in your kitchen that leads into a warehouse! 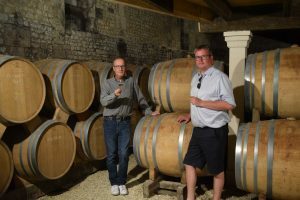 Francois and I opened several casks and then Francois left me to it – he was in a warehouse with a Cognac thief, several sample bottles and a box full of glasses and he told me “to help myself to anything I wanted.” He obviously doesn’t know me that well! Francois returned some time later – relieved to find he still had some stock left and, at this point, I had narrowed down the selection to 8 samples. This was all done completely blind as the cask ends had numbers on them but not anything that I could decipher into any form of age or pattern so literally I was picking these samples blind. We took the samples back to the office and the next day I made my final selection and the contents of those casks are due for despatch to Scotland today, ready for bottling later this year. You will have to wait to see what I have selected. 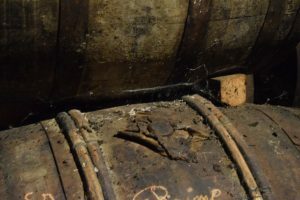 In Cognac they take cask management and maturation very seriously, often transferring the aux de vie from fresh barrels into older barrels to slow down the effect of wood on the maturation which is essential for when you are maturing Cognac for over 3 decades. 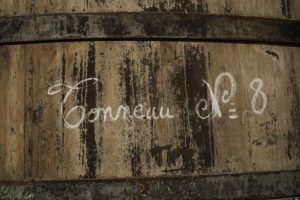 Also Cognac is often matured not in Barrels but transferred into large wooden vats of upwards of 20,000 litres. Initially, my whisky brain didn’t like the idea of this however following Francois’ expert knowledge and patient explanation it actually allows the cognac to marry and mellow at a slower rate and really allow the individual flavours to marry. I suppose it is just a larger version of our Small Batch series which many people think can be superior to Single cask bottlings as it allows a greater flavour profile than can be achieved from a single cask – although I will leave that debate on whisky for another day. 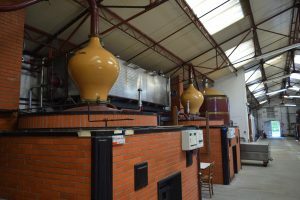 Having tasted some of the Cognac’s from these vats I was very impressed with several of them and will be looking to bottle some of these in the future alongside more single cask Cognacs. 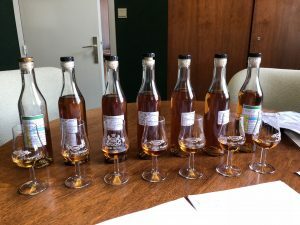 I tasted some exceptional Cognacs and some very old Cognacs and you could see the pride in Francois when he was able to say that the 40yo Cognac that we were drinking was distilled by his late father. At Cadenhead’s we are very much a family friendly employer and many of you will know that my wife Kate and son Zack are regularly seen around the place, either in my office, up at Springbank distillery or popping in to see me in the warehouse so it was nice that they were able to come with me to France (not only because Kate is fluent in French). France is very much a family orientated country and it was a great pleasure that we got to know Francois’ wife Shan Yu and his daughter Ines (who is only 10 days younger than Zack). Watching Zack and Ines playing together in the distillery whilst not being able to understand each other was also a mirror of myself and Francois; where I did not understand Cognac before this trip and Francois had a vague understanding of how Cadenhead’s worked in the whisky industry. 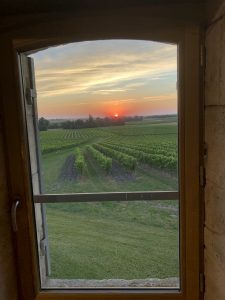 Although this trip felt like a holiday, it was very much a work trip and one which I hope has cemented a long term relationship between our two companies and I now know that we at Cadenhead’s can take a great pride in bottling these excellent Cognacs. One final thing I took away from the trip was how good Cognac and tonic can be! Following a long day of sampling we all met up to have some pre dinner drinks and Francois insisted we try a Cognac and tonic water, I have to admit I was sceptical but it was thoroughly refreshing in the heat that we have all been experiencing and, as we discovered as the night continued, as Francois put it “the better the Cognac you use the better it is” pouring some XO into our glasses – and I couldn’t agree more! A Selection of other photos from the trip. Great article Mark! Love all of the insight. Look forward to seeing the results of this trip later in the year when they’re bottled. Great article definitely going to try with tonic could be the new trend drink.